Having eaten sushi all over the city, I was intrigued by the rave reviews Kai Zan has been receiving and the selectiveness for reservations. And, after trying to get a reservation at a decent hour for several weeks, we decided to take the 9:15pm opening on a random Thursday night. I thought to myself, it must be great if everyone is flocking to give Kai Zan a try. Located in West Town, the restaurant is much smaller than typical sushi restaurants. A few private booths are available, otherwise, you are seated in a very crowded main room with a huge sushi bar as the centerpiece. Their menu features both a chef omakese menu, an a la carte version, and is BYOB. At $65+ per person for the chef tasting, we decided to order everything a la carte, which turned out to be the best version. Their sushi is much different from the traditional maki roll menus. Here, most are served as one bite creations and are individually or 2-piece priced. Kai Zan is on the higher price range of all sushi restaurants I have tried, but it is also the highest quality and best tasting in my opinion. No one else has such unique creations with scallops and uni. It was a no-brainer for me... 5-mile rating without any hesitation. Having entered Kai Zan starving, we all wanted appetizers. 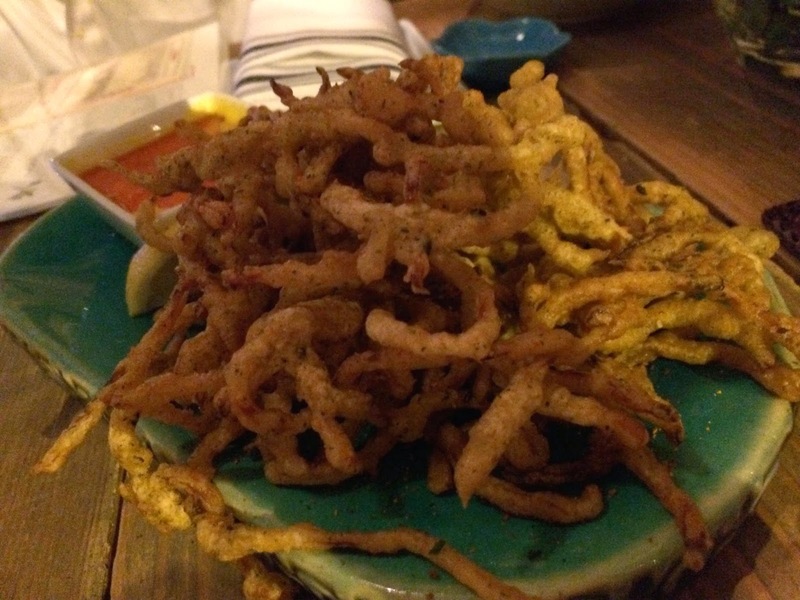 Without reading the description, we ordered the calamari fry dish to share. This dish is much different from your traditional Americanized calamari appetizers. Here, they use thin strips of calamari that resemble the flavor of previously dried and rehydrated squid. They flash fry it and serve it with more of a vinegar based sweet and sour sauce. So for warning, the calamari has more of a fishy flavor that most are probably used to. It also has more of a chewy texture. I thought it was a creative take on calamari and a good dish to share, but the fishiness might persuade you to think twice before ordering. 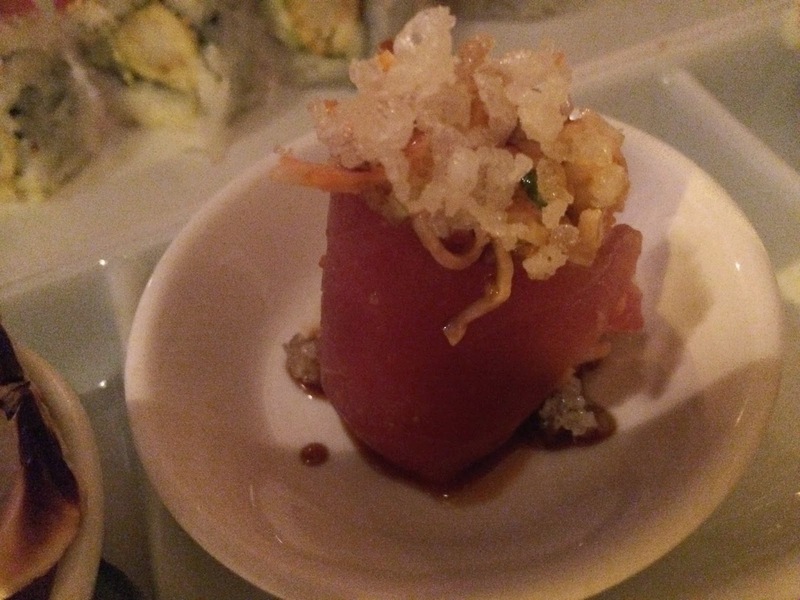 The Orange Rush had been featured on several blogs as one of the best bites of sushi in Chicago. I preferred a couple other dishes before this one, but it is still amazing. 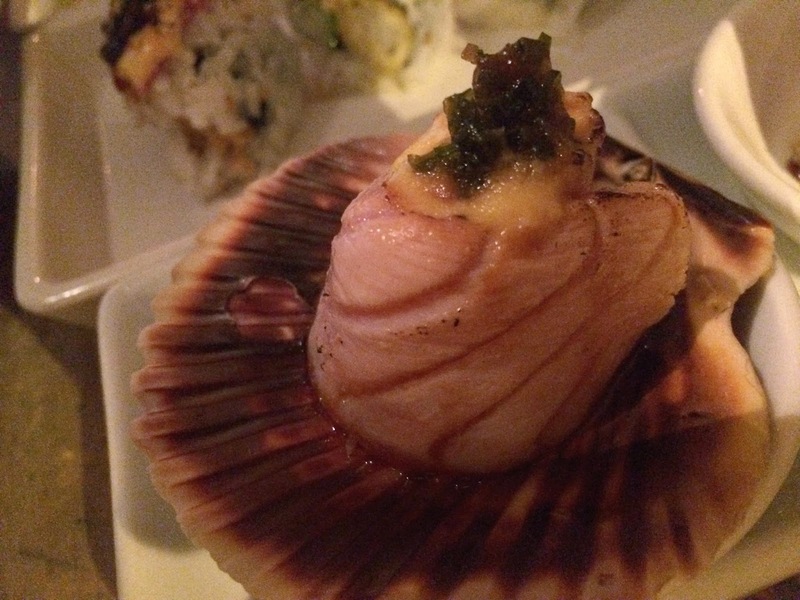 Served in a scallop shell, the scallop is wrapped in salmon before being light seared. It is topped with a citrus glaze and a little tobiko. This bite is served warm which is a great contrast to typical sushi. The salmon is the dominating flavor in the dish which is paired well with that citrus glaze. Great textures and flavors making it another must try dish at Kai Zan. This was my favorite bite of the night. The Angry Crab Sushi is one of the signature dishes. Each order comes with two pieces of spicy crab mixture wrapped in fresh tuna and topped with crunchy tempura chunks and togarashi. The dish is a little interesting because the topping is slightly warm while the fish is still chilled. But the flavors are absolutely amazing... you get the nice spice from the crab mixture and a great fattiness from the tuna. There are contrasting textures from the smooth fish to the crunchy tempura. And, finally, they top it with enough soy sauce to allow the fish to shine. Don't add anything extra, just eat what they serve and you will not be disappointed. The waitress told us that the escolar pearls were part of the Omakase menu so we also decided to give it a try. These "pearls" are rice spheres topped with scallions, super white tuna, and mixture of soy sauce, truffle oil, spicy mayo, and chili oil. The spheres are then lightly seared and served with a side of young ginger. The dish comes with 4 pieces, and my only complaint was I wish it came with more. The super white tuna is the perfect delicate fish for the sushi. It allowed the sauce mixture to shine but also kept its fish flavor. Make sure to eat a little ginger before eating the pearl because it clears your palate for the bold, yet delicate flavors of the sushi. Most sushi restaurants offer oyster shooters (so does Kai Zan), but when we had an option of an uni shooter, my friend Jing Jing and I knew we couldn't pass it up. 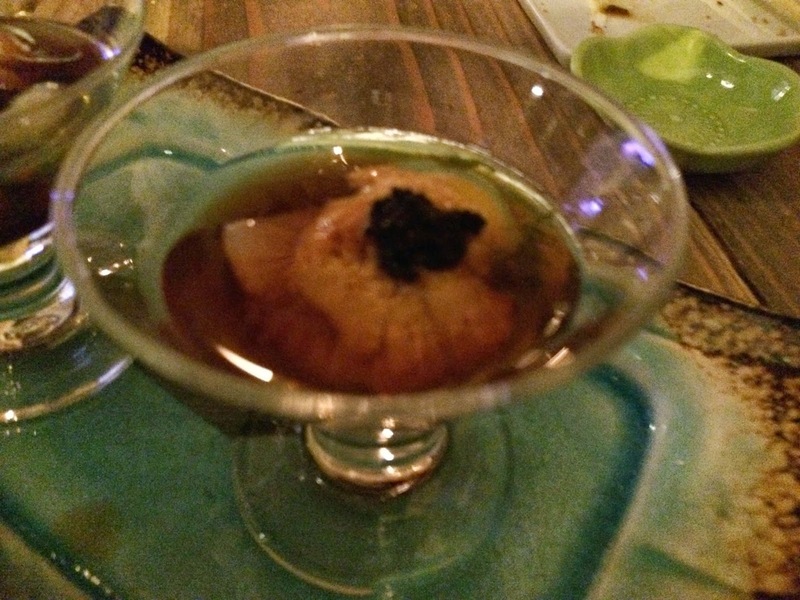 The shooter was made with a little soy sauce, yuzu, tobiko, a raw quail egg, and of course a nice piece of uni. Unfortunately, the shooter was overpowered by the citrus flavor of yuzu and the saltiness from the soy sauce. I actually wouldn't recommend the shooter. BUT, we also ordered a couple pieces of uni sashimi. And that was absolutely incredible. Both Jing Jing and I thought it was some of the best uni we ever had. Each pieces was chilled to perfection and almost melted in your mouth as soon as it hit your tongue. It was extremely rich and creamy. I highly recommend the uni sashimi and pass on the uni shooter. After all of the signature items were tasted, we decided to try both of their signature maki rolls as well. 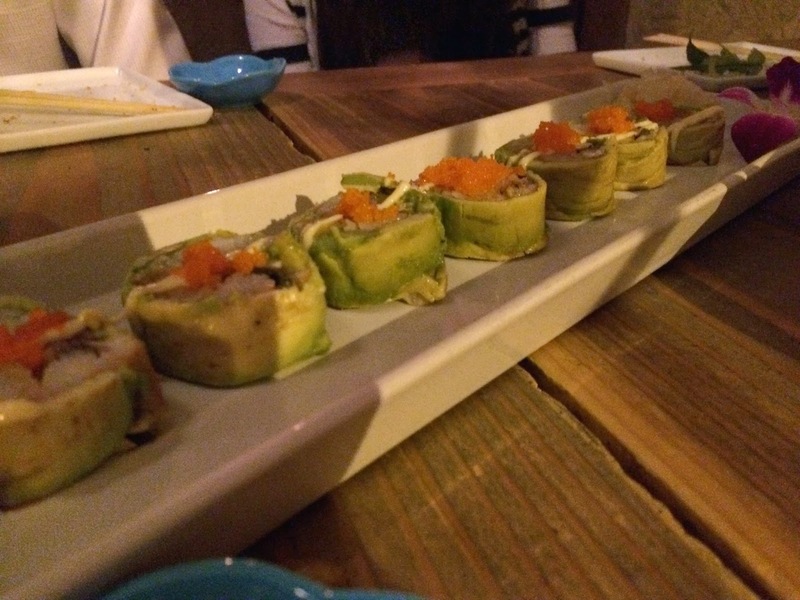 The first was the green monster roll (pictured above). It is called the green monster because of the sliced avocado that envelopes the roll. Being a seaweed-less roll, the other ingredients flavors are much more prominent, especially the shrimp tempura. The main texture is creamy from all the avocado. I really enjoyed the roll because no soy sauce was needed. 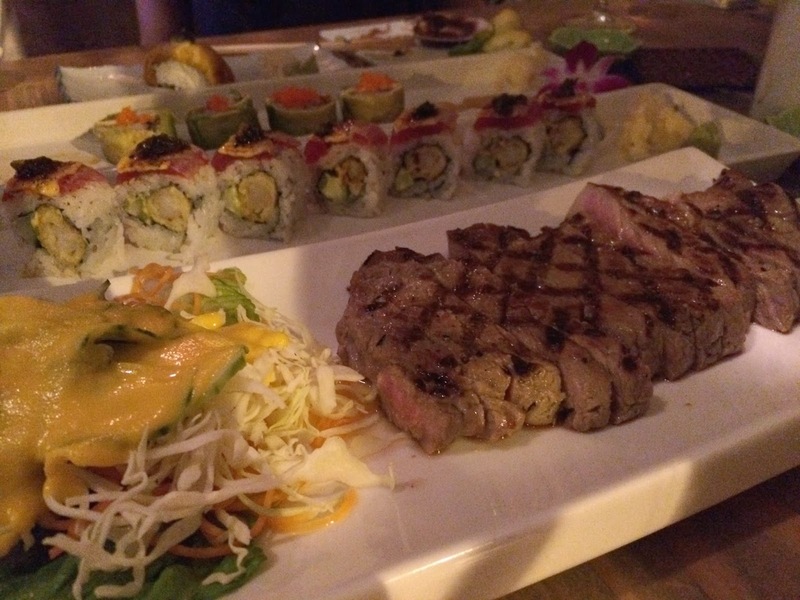 The second signature roll was called the flaming tuna roll (pictured below, behind the steak). It was more traditional being wrapped in seaweed and filled with shrimp tempura, spicy tuna, and avocado. It is then topped with seared tuna and a spicy mayo. I thought there was a little too much similarity between this roll and their green monster with the green monsters setting a much higher bar. The roll was very typical for any sushi place but of course was held to a higher standard with premium ingredients. I suggest ordering the green monster over the flaming tuna, but if you prefer spice, then choose the latter. Since more of the sushi dishes are one-biters or small plates for sharing, we decided to order a few larger plates to also share. My friend Eric and I chose the steak entree which was a NY strip seasoned with yuzushio and served alongside a citrus-dressed salad and a cup of white rice. The steak itself was a huge portion cooked to a perfect medium temperature. A strong citrus flavor once again prevailed from the yuzu. It was tender and filling. Great cut of meat, especially at a restaurant that features fresh fish. Prior to receiving our sushi rolls and the steak, our hunger once again took over and we also ordered the larger yaki soba plate to share. 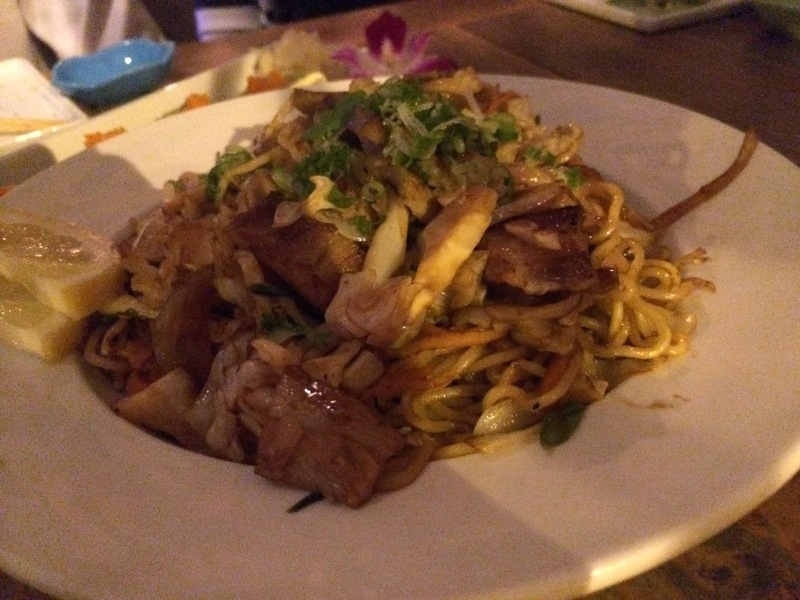 The yaki soba is made with sautéed egg noodles and chopped bok choy. You have the option of adding pork, beef, or shrimp... which we added the pork. This reminded me of a gourmet version of the instant noodles you can buy at the Asian grocery store. It had tons of meat and a fresher feel with those vegetables. The sauce was both savory, citrusy, and spicy. Such a filling dish so be sure to share it with your table! - All about sharing here. Most of the dishes come with multiple pieces for a reason. - Do order all of their signature sushi. These are completely different from your traditional sushi rolls but you will not leave disappointed! - I don't suggest ordering the Omakase menu. The cost starts at $65 per person and included similar menu items to what we ordered. Honestly, 4 out of 5 were exactly the same and one was an off-the-menu item. I think after eating here a few times, it would be an option to consider. I also heard that you can customize your own Omakase menu if you speak with the chef earlier in the week. Pictures of all the cuisines looks yummy specially the fried Calamari and beef steak. I had sushi on my visit to Dubai but dint like the taste of raw fish!